The light-colored area in this image shows recent gully activity on the surface of Mars. In a blowto hopes for finding water and life on Mars, scientists think bright streaksdetected inside Martian gullies after 1999 were not spurts of water, but ratheravalanches of dust. Water isthought to have covered much of Mars in thepast, but whether or not the life-giving substance has shown up in therecent past is a matter of debate among scientists. 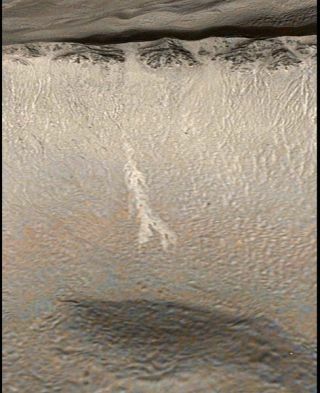 The strange,streaky formations were not present in Mars Global Surveyor 1999 images of thegullies. Seven years later, however, the bright streaks made their debut in newimages, prompting Michael Malin of Malin Space Science Systems and hiscolleagues to conclude that a recent burst of Martiangroundwater might be responsible. But JonPelletier, a geoscientist at the University of Arizona (UA) in Tucson, and his team now say "pure liquid water" is unlikely to have made suchformations in the Centauri Montes region of Mars. "Thedry granular case was the winner," Pelletier said, referring to a dustymode of creation. "I was surprised. I started off thinking we were goingto prove it's liquid water." Pelletierand his colleagues' findings, which are based on MarsReconnaissance Orbiter images taken by High Resolution Imaging ScienceExperiment (HiRISE) camera, will be detailed in the March issue of the journal Geology. Since 2006,HiRISE has provided the most detailed images of Mars ever taken from orbit,giving Pelletier a chance to offer a second opinion on the existence of liquidwater that might still support life beneath the RedPlanet's surface. "Whatwe'd hoped to do was rule out the dry flow model," said Alfred McEwen, aUA professor and leader of the HiRISE team. "But that didn't happen." Althoughthe new study doesn't rule out a watery creation of the bright streaks,Pelletier and McEwen said a bone-dry avalanche of dust and rocks is the mostlikely culprit. Theirconclusions stem from work with 3-D maps created with HiRISE image data. "Thisis the first time that anyone has applied numerical computer models to thebright deposits in gullies on Mars," Pelletier said. When hecompared the brightdeposit and its HiRISE image to the predictions made by the model, the dryavalanche model was a better fit. "Thereare other ways of getting deposits that look just like this one that do notrequire water," Pelletier said.